An interesting addition to a collection of beer steins can be made by obtaining one or several American Belleek steins. The most familiar name is Lenox, but it requires more knowledge than just a single name to accurately describe the various types of steins found in this group. American Belleek, briefly described, is a thin, highly translucent feldspathic body, finished with a thin, pale pearly glaze. While American Belleek is a recent development, compared to other types of porcelain, it does have an interesting background. It traces a beginning back to Philadelphia and the Centennial Exhibition of 1876. A display of very thin, light-weight glazed Irish Belleek drew much attention from the visiting public. This interest resulted in a number of efforts to produce Belleek in this country in the following ten to fifteen years. In 1882, the Trenton, N.J., firm of Ott and Brewer developed their Belleek ware through the efforts of William Bromley, an Irishman, and Walter Scott Lenox, a native of Trenton. Seven years later in 1889, Lenox — in partnership with Jonathan Coxon — founded the Ceramic Art Company (C.A.C.) in Trenton. From 1889 to 1896 this firm produced lidded ½ liter steins, such as the type shown in Figure 1. The shape of the stein during this period was of one design and it was in production for over ten years. The color of the decoration determined the color of the bottom stamp (mark), which showed the C.A.C. initials surrounded by a wreath. Decorations favored sporting scenes, with monks and wine cellar scenes providing a good share of the remainder. The white Belleek body provided a good background for the single color designs, usually in blue — with green or brown appearing less often. Generally the glaze finish over the transfer-type decorations was heavy and glossy. While Belleek is generally considered a fragile item, it should be noted that the steins were made fairly heavy and strong enough to stand up to a normal amount of use. The attractive dome-shaped sterling silver lids were manufactured by the Gorham Silver Co. of New York. C.A.C. sold the belleek ware to Gorham and the lids were attached by that company. A machine screw was used to fasten the lid assembly together at the handle. Gorham distributed their steins, and other types of belleek finished with sterling silver, to jewelery and department stores. While C.A.C. was not the first American pottery firm to produce steins, it is obvious that their early attempts were made in limited quantities. Perhaps this was an attempt to test the reception of such an American-made product. A limited lid supply could also have influenced the production. Yet another view may suggest that imported beer steins dominated the buyer’s interest too greatly to allow any sizable competition. In 1896 Walter Lenox became the sole owner of the Ceramic Art Company and as a result there appeared changes in the steins. First, the Lenox name was added to the C.A.C. bottom stamp. 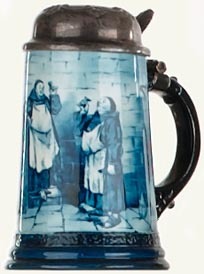 Different stein body shapes were introduced and one-liter steins were added also. New sterling silver lids, and copper and silver lids were made. The Gorham lid was replaced with a second design, heavier and more durable, but less attractive than the original one. Glaze finishes became thinner and less glossy. While this helped the overall appearance, this change resulted in any nicks and scratches in the white-ware Belleek showing through the glaze and decoration color. Today it is normal to find these small white spots on otherwise near-perfect steins. 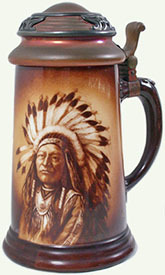 An American Indian Chief of the Chickasha Tribe, Creek Nation, is shown on the C.A.C.-Lenox ½ liter stein in Figure 2. The decoration and bottom stamp are both of a brown color, with a thin, light over-glaze. The copper lid trimmed with sterling silver is believed to have been made by the Tiffany Co. of New York. The lid assembly, composed of eight separate pieces, was attached to the handle by means of a machine screw, and is stamped with the number DY287B. 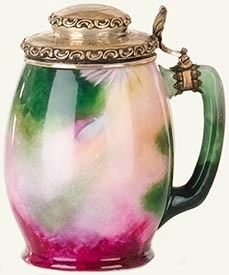 A hand-decorated ½ liter C.A.C.-Lenox presentation stein is shown in Figure 3. 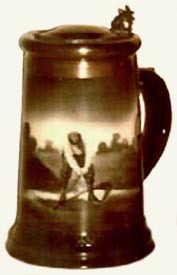 This stein was presented to its proud owner for having the low gross score at the Westfield, N.J., Golf Club, May 30, 1904. The green decorated scene is of two golfers, fairways and club house. The inscribed sterling silver lid is another example of the types found on these steins. The decorative thumblift is attached directly to the lid over a small, thin hinge. This unusual design was accomplished by means of a sterling silver rim around the top of the stein, thus providing a means of attaching the lid and hinge. The ½ liter stein shown in Figure 4 was made for sale as undecorated white-ware. The Art Nouveau hand-applied decoration was completed by Theodore B. Starr of New York City. The bottom stamp shows a wreath enclosing “The Ceramic Art Co. — Trenton, N.J.” This type of mark was applied to items sold on contract or to other professional decorators. The sterling silver lid, dated Feb. 17, 1898, was made by Starr, who was a partner in the Black, Starr and Frost Silver Co. of New York City. 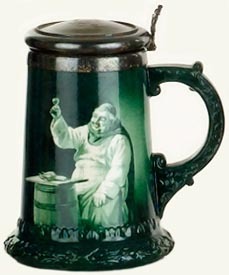 A green colored ½ liter C.A.C.-Lenox stein, featuring a monk with a liqueur glass, is shown in Figure 5. The stein body has a somewhat broader and heavier base than either C.A.C. monk stein or the C.A.C.-Lenox golfer stein, but the sterling silver lid and mounting hardware is identical to that found on the golfer stein. Early American Belleek, although close to eighty-five years old, shows no signs of age crazing, a credit to the formulators of the white-ware and the glazes. A ½ liter Belleek stein manufactured by the Willets Company of Trenton, N.J., is shown in Figure 6. 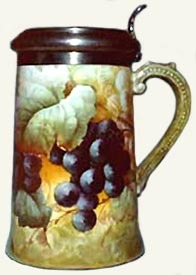 The hand-decorated multi-colored grape design was signed by J.V. Fries, 1900. This colorful lightweight stein weighs only 10 ounces due to the very thin, translucent body. A rim-mounted sterling silver lid contains a Belleek porcelain inlay, also hand-decorated. Willets made very few steins and this is a very good example of their limited production. In addition to the Willets bottom stamp, the number “511 1/2” appears in pencil, under glaze. This type of hand-written mark-under-glaze is highly sought by Willets collectors. The ½ and 1 liter C.A.C.-Lenox steins illustrated in Figure 7 have identical decorations of two monks playing cards. The smaller stein has a brown decoration color and the lid assembly is marked DY284B. The larger stein is decorated in a black color and makes a very good appearance — one of the better designs. The lid design is composed of two copper sections and two silver trim pieces, held in place by a large, two-piece decorative rivet. The thumb-lift is stamped DY290B. The so-called “pallette” mark of C.A.C. (used from 1889 to 1906) has been found on decorated mugs — probably sold as white-ware and decorated outside of Trenton — but no examples of lidded steins, as we know them, have been seen with this mark. The Lenox method of manufacture was time-consuming and demanding. Centuries-old methods were combined with new ideas and developments. Lenox used electric motors, air compressors, electromagnets and conveyor tables to advantage to accomplish the manufacture of Belleek white-ware. Feldspar, several types of clay and flint were the primary ingredients of the white-ware bodies. The materials were mixed in the right proportions with filtered water and tumbled in porcelain-lined revolving cylinders for two days. The mixture was then strained through wire-mesh screens by means of air pressure for two hours, during which time an electromagnet removed any iron particles. The result was a fine textured cream-colored fluid called “slip.” Aging of the slip was the next step and involved from two to three days. The molding tables followed, with finished shapes being oversized by 20% to allow for shrinkage in the firing process. After shaping, the body was inspected and then allowed to dry over a period of one to two days, during which time the shape was sponged to slow the drying process and during which it was continually inspected. To avoid discoloring or cracking in the direct heat of the kiln, the stein bodies were placed in covered cylinder-shaped containers called “saggers,” which were filled with a loose, coarse clay. Workmen carrying these stacked saggers on their heads would climb ladders to the top of the 14-foot high kilns. After the kiln entrance was tightly cemented shut with fire bricks, the fires were started. The heat was gradually increased to the desired temperature of 2200°F (1200°C) and held there for 30 hours. At that point the temperature was decreased in a stepwise cooling process consuming two full days. Almost 40% of the fired biscuit ware, as it was called, was discarded due to kiln damage, cracking or warping. 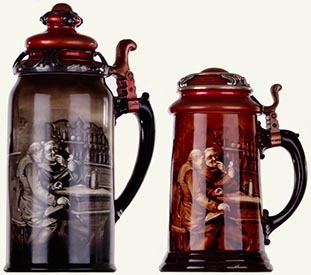 Most factory-produced decorated steins received transfer prints. Others still were hand-decorated, but not all were signed by the artists. The finish glaze was then applied, followed by another inspection. The top glaze received a final firing in a “ghost” kiln, at 2100°F (1150°C). By 1905 steins had almost disappeared from C.A.C.-Lenox sales. This was due to the success of the table service china which the company was producing. Many other C.A.C. Belleek items were discontinued to allow for further expansion into the manufacture of dinner ware. In 1906, Walter Scott Lenox reorganized C.A.C. into Lenox, Inc., which brought to reality a dream of many years! Mr. Lenox died in 1920, blind and paralyzed, but he left behind a successful business which continues to this day. And his very collectible C.A.C.-Leonx beer steins testify to his fine craftsmanship, his creative ability and his perfection of this ceramic art. Lenox China – The Story of Walter Scott Lenox, Lenox, Inc., Trenton, N.J., ca. 1920. Lenox China – The Story of Walter Scott Lenox, Lenox, Inc., Trenton, N.J., no date. 6 mimeographed pages, still available today. Fine China – That’s Their Dish, Lenox, Inc., Trenton, N.J., no date. 5 mimeographed pages, still available today. Editor’s Note: Black and white pictures originally appearing with this article have been replaced with color photographs containing similar subject-matter. New material ©2004 Beer Stein Library — All rights reserved.